The mix of novice riders and unpredictable animals at a riding school can be a dangerous one, if safety precautions are not taken and rules adhered to. Thankfully most riding schools have stringent safety measures in place, especially if they are an approved centre. Therefore, it is wise to know what to look out for in terms of safety when choosing a riding school. Most of the equipment you will be using on riding lessons will be loaned to you by the riding school. It should all be of very high quality and not damaged in any way. Anything damaged is not a good sign, and, if you are given anything which looks worn or damaged, give it back to the instructor and ask for another one. Although worn equipment is not necessarily faulty, if it is old and well used, its safety features may have been compromised. This is most true when it comes to your riding hat. You will usually be able to borrow a hat although it is always preferable to buy your own from new. If you do decide to borrow one, look at it carefully. The problem is you will not know if there is any damage to a hat or if it has ever been involved in an impact – which can be anything from dropping it onto a hard surface. And more than anything, a school which does not insist its riders wear a hat is not worth looking at for your lessons. If they scrimp on this area of safety, goodness knows what else they will omit. For optimum safety, placid horses should always be used for novice riders and any decent riding school will have these in plentiful supply. They are usually known as schoolmasters and are older horses which are used to new riders. They will not get annoyed or bolt if the rider does something wrong, and will be safe for the new rider and help them to learn their new skills. Schoolmasters should also be able to stand still in one place for long periods of time without getting restless, while newly mounted riders are told exactly what to do and are getting used to sitting on a horse for the first time. Small classes are always safer for everyone concerned, especially if the pupils are novices. Private lessons are obviously the most safe form of lesson as the horse and rider will have the instructor’s undivided attention. Whatever size of class, the instructor should always be able to see everyone in it, and they should all be able to see her. Everyone in the class should be of similar abilities to stop the instructor being monopolised by the weakest in the group or someone who needs extra attention because they are further ahead than everyone else. No one should be forging ahead or getting left behind. 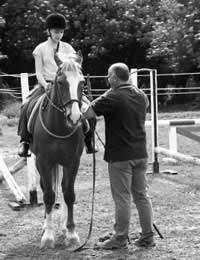 There are plenty of other safety measures horse riding schools will take and many of them are common sense. The health and safety guidelines should always be displayed in a prominent position for instructors and pupils to be able to refer to as and when they are needed and to remind people, especially visitors, of the safety measures needed. All staff should have safety training and there should be a first aider on site. And there should always be an incident log book for staff to record any accidents that happen – so they can learn from them and, if possible, prevent similar ones happening again. Safety is the most important thing when choosing a riding school. It does not matter if every other little thing is right and you love the school – if the safety measures are not in place, do not ride there. Safety is the one thing you cannot compromise on and while you can always find a new riding school, you cannot get a new body if you get injured.